We also handed in a letter, setting out detailed policies the UK government could introduce to help achieve these aims globally. Unfortunately, the reply from the Chancellor the Exchequer, George Osborne, largely ignores these policy suggestions. Below we set out what it does, and does not, say. 1) We suggested: The UK government change its policy and support the creation of an independent arbitration mechanism for dealing with sovereign debt crises. George Osborne’s reply: Ignores this proposal. The Chancellor refers only to the Heavily Indebted Poor Countries initiative, a one-off debt relief process which currently only applies to one country (Chad). Thirty-five other low income countries have qualified for debt relief under the scheme, and the IMF and World Bank say it is “coming to an end”. Other heavily indebted countries – including Jamaica, Grenada, El Salvador, the Philippines, Pakistan, Tunisia, Greece, Ireland and Portugal – do not qualify for the scheme because they are ‘too rich’. 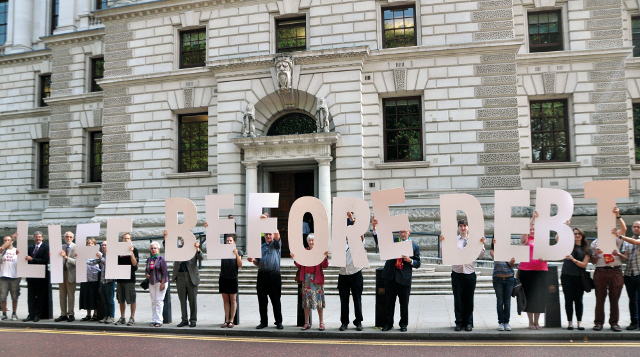 2) We suggested: The UK government extend the UK Debt Relief (Developing Countries) Act to all internationally agreed debt write-downs, including Argentina and Greece, to prevent vulture funds profiting from debt crises. George Osborne’s reply: Ignores this proposal. 3) We suggested: The UK government hold a public audit into the debts owed to UK Export Finance, and cancel the unjust debts, such as loans for arms sales to now deposed dictators. George Osborne’s reply: The Chancellor says debt relief should only be provided “on the basis of a country’s economic needs”, ie, not because loans were given immorally in the first place. However, where a country’s economic needs clearly require debt cancellation – such as Jamaica, Grenada, Greece and Ireland – the UK government has not said it supports debt cancellation either. 4) We suggested: The UK government end the cuts to corporation tax in the UK which are leading a global race to the bottom, scrap changes to Controlled Foreign Company rules which will make it easier for companies to avoid tax, and stop UK public money being invested through tax havens, through institutions such as CDC and UK Export Finance. George Osborne’s reply: Ignored all three of these specific proposals. Says the government’s priority is delivering “strong, sustainable and balanced growth”. 5) We suggested: The UK government remove financial services liberalisation from the EU-US free trade agreement and the World Trade Organisations negotiations on removing regulations on services trade. These negotiations could make it more difficult for governments to be able to regulate the lending of banks and financial companies. George Osborne’s reply: Ignored this proposal. Says “promoting trade liberalisation and ensuring we have effective financial regulation are all key elements of the Government’s strategy to deliver growth”. This does not respond to the fact that ‘trade liberalisation’ through the above trade negotiations is about removing financial regulation. 6) We suggested: The UK government reduce the amount of aid the UK gives through loans via the World Bank; not introduce a new lending facility for the aid money the UK gives directly; and make UK Export Finance conduct human rights, environmental and social impact assessments on all the loans it gives and guarantees. George Osborne’s reply: Ignored all of these proposals. There is currently a motion in parliament calling for the UK government to take action on two of these issues in particular – stopping vulture funds, and supporting the creation of an independent arbitration mechanism to deal with debt crises – which has been supported by over 80 MPs.